Making stuffed chicken breasts is a good way to "fancy" up an ordinary dinner staple. Its not as boring as baking chicken, can be extravagant or simple, and doesn't add a lot of work or complex prep to your meal. Trim chicken breasts of any fat, separate breasts and tenders and butterfly each piece. Place each piece between 2 sheets of plastic wrap and pound to 1/4" - 1/2" thick with a meat tenderizer/mallet or rolling pin. In a gallon size plastic bag, combine dressing, lemon juice, and rosemary. Add chicken to bag and refrigerate about 2 hours to marinate. Preheat oven to 400 degrees. Spray a baking dish with cooking spray. Melt butter in a skillet over medium heat, add onions and garlic and saute about 5 minutes until softened. Mix with bread cubes, apple, 1/2 cup cheddar cheese, and spices. Add chicken stock and mix until well combined. Season both sides of chicken breasts with salt and pepper and add about 2 T of stuffing mixture to each piece. Roll up and place seam side down in prepared baking dish. 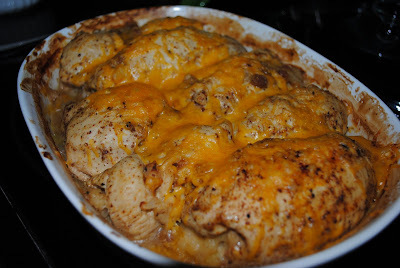 When all the chicken is added, sprinkle the top with remaining 1/4 cup cheddar cheese and bake for about 30 -40 minutes until chicken is cooked through. Internal temperature should be 170 degrees. Bake extra stuffing in a separate dish for approximately 30 minutes.